Personalized Engraved Baby Girl First Curl & Tooth Keepsake Silver Box Set. It so cute a baby tooth holder will make the perfect family keepsake for years to come. You have to have this for the baby room decoration. 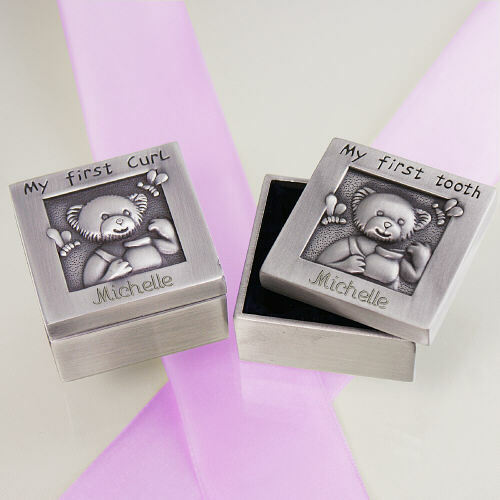 Baby First Curl and Tooth Silver Box Set is a beautiful and traditional keepsake. It has a raised Teddy with My First Curl and My First Tooth. The First Curl and Tooth Set makes a unique gift for a child's birthday, baptism or christening gift. Each engraved box measures 1 1/2" square. Engraved new baby name, up to 16 letters. I love this so much the perfect baby gift.. I order 2 for twins for my sister. My Sister loves Box set so much.. It set on the baby set. 5 Stars!! I recommend as the perfect gift for anyone..